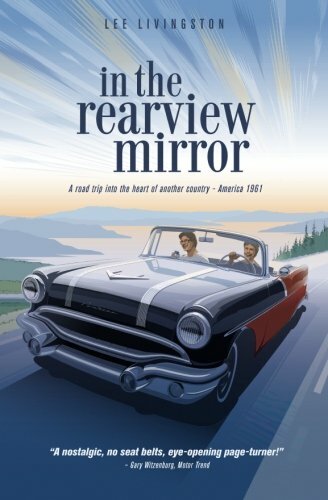 “In the Rearview Mirror” by Lee Livingston is a testament to times when life was simpler and the world wasn’t so concerned about being politically correct. Yet at the same time, knowledge about mental illness wasn’t as defined as it is today. Through the eyes of the author, we relive the era of living in the early ’60s with the music, cars, hitchhiking and carefree attitude. Lee and his friend Dango, on a road trip, decide to return to Cleveland Ohio with stops in Vegas, riding the rails and the ultimate challenge of hitchhiking. Dango’s easy going, no-big-deal attitude rubs off on Lee, and the adventures begin. Readers will find Livingston’s story to be funny and scary, brave and exciting. Having been raised by a British mother in a sheltered lifestyle, I can only imagine the creative and exciting adventures. The language is one in which the author provides the most realistic view of the times. I enjoyed the various encounters with the individuals these two met along the way and how their knowledge of the real world was enriched through these people. The adventures of meeting girls and thoughts of “scoring” were hilarious. Livingston does an excellent job of addressing bipolar and how little we knew about it in the sixties. “Wish I didn’t know now what I didn’t know then,” sums up what the author learned about his friend’s death and the impact bipolar has on individuals. Thirty years later, the author relates he didn’t know too much about it. He was angry, and felt guilty about losing touch with Dango. He had been busy, going through marriages, changing job, and sometimes just didn’t want to be bothered. Given Dango’s love-hate relationship with his mother, it is no surprise that she was diagnosed with manic-depression and institutionalized several times. Yet, even knowing she had these concerns, she continued to try to ruin Dango’s life and is the person who was responsible for breaking up his relationship with his fiancé. “In the Rearview Mirror” by Lee Livingston is a very enjoyable and remarkable read about true friendship, coming of age and the demons that attack one from inside. For those who grew up in this era, it will bring back a lot of memories. Highly recommended reading.